You’ve tearfully packed away the swim shorts, sun loungers and suitcases, and your calendar’s suddenly looking bereft of BBQ commitments. Summer may be over for another year, but there’s no time for back to school blues. Why? Because you’ve got an autumn wardrobe to sort out. Here, we’ve done the hard work for you, separating the seasonal wheat from the chaff to harvest a selection of versatile, trend-proof pieces that every man should have in his cold-weather arsenal. ‘Drowned rat’ is a look even David Gandy would be hard pushed to pull off. And while an umbrella is absolutely worth adding to your accessories collection, a wearable waterproof layer has the added benefit of being much less likely to go walkabout. The best rain jackets smartly blend function with fine design, so you can stay dry without looking like an awkward tourist. Top of the shopping list should be styles that are 100 per cent waterproof (not water-resistant or showerproof), come equipped with ample pockets, taped seams, and are also easy on the eye – you needn’t worry about anything techier unless you’re planning a mountain trek. Italian outerwear expert Stone Island offers superb weather-proof outerwear, while Scandi specialists Rains and Stutterheim both produce simple, wearable designs in several vibrant colours and lengths. Looking good underfoot isn’t much of an issue when the sun’s shining, but you’ll need to rethink your footwear strategy once the leaves start falling. For something that’s smart and stylish but won’t wither in the rain and snow, add a pair of well-built brogues, Derby or Chelsea boots to your shoe rack. Smart but sturdy boots offer more coverage than a pair of shoes but are no less versatile. Dress them up with smart trousers or a suit and they’ll fit in just fine at most formal events, or keep things casual by teaming with a pair of selvedge jeans with the hems rolled up. When it comes to the finer points, ditch delicate suede for resilient grain or matte leather in classic black, rich tan or chocolate brown so they can be polished regularly as part of their upkeep. For enhanced durability (and to ensure you’re not coughing up for another pair of boots next autumn), keep an eye out for Goodyear-welted styles with a rubber or leather sole, which are solidly built and offer plenty of grip for braving spells of adverse weather. For quality on a budget, try Marks & Spencer and Ted Baker, or go premium with a pair from storied British shoemakers like Cheaney, Church’s, Grenson or John Lobb. Even though some cotton trousers are hardy enough for winter, wool styles promise the best combination of warmth and comfort. In recent seasons, a growing number of designers have joined the unofficial campaign for a wider leg cut, and although it makes for a (roomy) statement look, it’s not for everyone. To ensure longevity, opt for a slim – not skinny – cut instead and wear with a shirt and blazer for buttoned-up occasions or a white T-shirt and leather bomber jacket for an on-point high-low outfit combination. 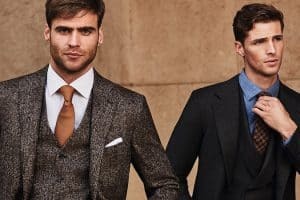 British brands are often best for this heritage style, so try the likes of Reiss, M&S, Oliver Spencer and Paul Smith for wool and wool-blend styles that are the definition of understated luxury. If you’re looking to invest, prioritise versatile colours such as navy, grey, brown or beige, which will match with everything in your wardrobe. If you’ve already got your neutral bases covered, consider acquiring a more seasonal option in burgundy, bottle green or burnt orange to give your cold-weather looks a seasonal lift. Unlike their chunkier cousins, lightweight knits – whether you opt for a cardigan or jumper – can be easily layered over a shirt or tee and worn under a jacket or blazer without running the risk of looking like a fitness magazine’s unfortunate ‘before’ picture. For modestly priced options that deliver great value try Uniqlo, Topman’s Premium line and H&M, all of which offer a generous selection of merino, cashmere and cotton styles in a variety of cuts and colourways. Or, for knitwear that really is a notch above, turn to the masters at John Smedley or Loro Piana. Whether it connotes nineties Seattle or noughties Willamsburg for you, the flannel shirt has worked its way from sideline separate to wardrobe staple in recent years. Its appeal in autumn is obvious: you can wear it open over a T-shirt on milder days, or button it up and layer under a canvas chore jacket when the breeze picks up. Plain colour styles in grey, navy, deep red, military green and beige give you plenty of opportunities for wear, while a classic red and black buffalo check has been on trend for decades. Try the former with a knitted tie on dress-down days in the office, or play up the latter’s workwear affiliations by teaming with boots, twill chinos and a denim jacket. You’ll find a wide selection of authentic, re-worked flannel shirts on the high street in a wide variety of colourways and plaids from the likes of J.Crew, Selected Homme and H&M, while specialists such as Portuguese Flannel and Gitman Vintage are go-tos for high-quality options. The secret to dressing well for autumn is keeping your style adaptable. Denim has been in the mix since the mid-19th century so has had more than enough practice at flitting between whatever mother nature throws at you. Handsome and rugged in equal parts (but enough about us), a denim shirt is a wardrobe classic well worth adding to your collection of staples. Steer smart with a lighter weight (or chambray) example for a piece that can easily slide under a suit jacket or add some rugged outdoor appeal by bulking up with something weightier before finishing with dark denim and brogue boots. However you chose to wear yours, remember that the colour (or the wash, to use the denimhead term) will influence how formal it appears. As with most pieces, the darker the finish, the smarter it is. So if you want to be able to throw on a knitted tie for dress-down days, opt for a dark wash. Try J.Crew, Levi’s and Gap for high-quality shirts that don’t cost the earth, while names such as Jean Shop, Incotex and Ralph Lauren offer some stand-out options at the higher end of the price spectrum. Even a man with only a fleeting interest in style will be familiar with the versatile and weather-beating properties of a leather jacket. Much more than just marketing spiel, cowhide coats have been through it all – from time in the sky as a flight jacket to time on the screen giving men like Marlon Brando even more edge. In autumn, the water-resistant outer shell does its best work thrown effortlessly over a simple white T-shirt, a look that can be gradually built on with layers such as a grey hoodie as the weather worsens, but it can also be subbed-in for a suit jacket to amp up your work attire. A black biker jacket sets the high watermark, but as a way of standing out from the crowd, consider one of the many racer neck variations hitting rails this season or try out a different shade such as chestnut, which instantly refreshes the classic. Whether you buy on the high street – from the likes of Reiss, River Island or AllSaints – or make an investment – with Acne, Schott and Saint Laurent leading the way – always choose real leather where possible to get the most out of your purchase. If you listen carefully enough, it’s actually possible to hear sneakerheads shivering at the thought of the impending weather ruining their box fresh kicks. Of course, you could beat Mother Nature at her own game by skipping rent and buying a pre-battered pair from Golden Goose Deluxe Brand, but even with the premium price tag, they are unlikely to get a pass at work or in the bar. Instead, it makes sense to swap sleek white uppers and stain-attracting suedes for something all the more practical. Trainer styles in dark, muted leathers offer the same casual styling and superior level of comfort, without the need to dance around every mulchy pile of leaves. Though, that’s not to say a healthy dose of hydrophobic shoe protector wouldn’t go amiss. Most importantly, you needn’t step far from your favourite brands. The likes of Vans, Clae and Converse produce all their classic styles in shades that can stand up to sleet and snow come winter (Converse in particular has a line of weatherproof high-tops complete with insulating booties), as do Common Projects, Eytys and Filing Pieces for the big spenders.